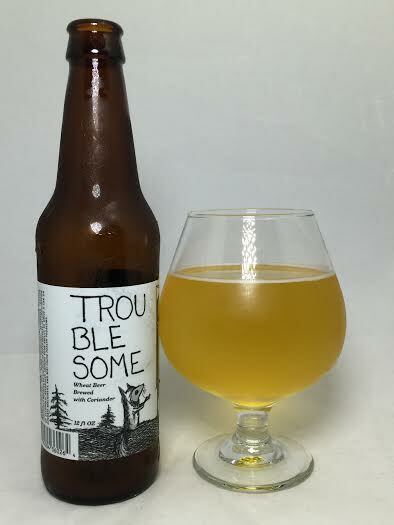 A combination of a wheat beer and a sour beer fermented solely with lactobacillus, Troublesome is Off Color Brewing's attempt at the Gose style which has seen a resurgence in recent years. Pours a transparent straw yellow with little carbonation. There was maybe a quarter inch of fizzy white head that didn't stick around long. Lots of salt and coriander on the aroma with a yeasty character and a touch of banana. I think this owes more to its wheat beer foundation than its sour component. A noticeable pale malt or pilsner malt is actually what strikes me as most prominent, but not far behind are some breadiness and lemon. It's not acidic, but definitely a lemon taste. Sourness is making itself know, but it's not doing so in a tart way, but closer to a beer that is starting to go bad. I'm not sure if the small amount of mouth-puckering is from the bacteria or the addition of salt. Either way, it's not pleasant. The finish and aftertaste retain the sourness, but it's mostly pilsner malt and it doesn't leave you wanting much more than your 12oz bottle. Mouthfeel is light with noticeable tartness. It feels like a 4.30% beer and as far as a "session" beer it fits the bill, but the flavors don't truly make it that drinkable and it isn't crisp in any way. Troublesome backed up its name with a subpar Gose. It's not refreshing, salty, and pleasantly tart, but rather bready, doughy, and sour in a bad way. I'm not repulsed (well, I'm getting there) by any means, but the Gose deserves better.